General. Introduction.(T. Rothengatter, R. D. Huguenin). Driver Behaviour as a Hierarchical System. (E. Keskinen et al.). Behavioural Adaptation to In-Vehicle Safety Measures: Past Ideas and Future Directions. (C. M. Brown, Y. Ian Noy). 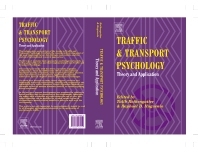 Theories of Science in Traffic Psychology. (R. Risser, W-R. Nickel). Road User. Cognition and Performance. Cognitive Effects of Environmental Knowledge on Urban Route Planning Strategies. (S. Chalmé et al.). Perception of Speed and Increments in Cars. (M. A. Recarte et al.). Comparison of Reaction Times at Low and High Speeds. (Tomoyuki Fuse et al.). Comprehension and Evaluation of Road Users' Signalling - An International Comparison between Finland, Germany and Japan. (Kazumi Renge et al.). Interaction and Communication in Dynamic Control Tasks: Ship Handling and Car Driving. (C. Chauvin, F. Saad). Training of Tram Drivers in Workload Management – Workload Assessment in Real Life and in a Driving/Traffic Simulator. (M. Normann et al.). Social and Differential Psychology. Road Safety: What Has Social Psychology to Offer? (D. Parker). Risk Taking and Self-Efficacy among Young Male Drivers: Self-Efficacy and Changing Task Demands. (P. Delhomme, T. Meyer). Errors, Lapses and Violations in the Drivers of Heavy Vehicles. (M. J. M. Sullman et al.). Anger and Aggression in Driving and Non-Driving Contexts. (P. R. Chapman et al.). Abusing the Roadway "Commons": Understanding Aggressive Driving Through an Environmental Preservation Theory. (B. E. Porter, T. D. Berry). Characteristics and Crash-Involvement of Speeding, Violating and Thrill-Seeking Drivers. (S. Stradling et al.). Driver Behaviour and its Consequence: The Case of Chinese Drivers. (Cheng-qiu Xie et al.). Are Female Drivers Adopting Male Drivers' Way of Driving? (S. Laapotti, E. Keskinen). The Relationship between Accidents and Near-Accidents in a Sample of Company Vehicle Drivers. (K. L Roberts et al.). Impairment. Fatigue and Driving. (L. R. Hartley). Why is Driver Impairment Difficult to Assess? (K. A. Brookguis, D. de Waard). Individual Differences in Driver Risk Acceptance During Sleep Deprivation. (J. B. Hurwitz). Compensation for Drowsiness and Fatigue. (V. Hargutt et al.). Cognitive/Neuropsychological Functioning and Compensation Related to Car Driving Performance in Older Adults. (R de Raedt, Ingrid Ponjaert-Kristoffersen). Safety. Driver Information and Support Systems. Driver Support Systems: Currents Trends. (G. Malaterre). Behavioural Adaptation to an Advanced Driver Support System. (P. C. Burns). The Effects of Different Display Types with Respect to Reading Numerical Information and Detecting Speed Change. (C. Castro, T. Horberry). The Brake Activity of Car Drivers and that of an Automatic Brake System in Simulated Critical and Non-Critical Driving Scenarios. (L. Harms, J. Törnros). Changes to Driving Behaviour in Conditions of Reduced Visibility Using an Infrared Vision Support System: Driving Simulator Evaluation Results. (P. Barham et al.). Attitudes to Telematic Driving Constraints. (S. Stradling et al.). Driver Assistance Systems: Safe or Unsafe. (O. Carsten). Enforcement and Training. Questions for Psychologists Related to Enforcement Strategies. (S. Siegrist). Evidence for the Effectiveness of a High Enforcement Strategy: A Case Study from the Republic of Ireland. (R. Fuller, E. Farrell). The Development of Training Courses for Switzerland's Two-Phase Driver Training Model. (J. Böchli-Biétry). Selection and Rehabilitation. Driver Selection and Improvement in Austria. (R. Christ et al.). Driver Selection and Improvement in Germany. (H. D. Utzelmann). Regrant the Licence Earlier? Effects of Accelerated Assessment and Rehabilitation within the Legal Ban Period of DWI Drivers in Northern Germany. (W. Jacobshagen). Driving Tests - Test Reliability, Consistency of Candidates Performance and other Issues.(C. J. Baughan, H. Simpson). Accident Proneness: The History of an Idea. (F. A. Haight). Mobility and Environment. Psychological Motivation of Pro-Environmental Travel Behaviour in an Urban Area. (M. Johansson). Car Use: Lust and Must. (L. Steg). Is Employees' Achievement Motivation and Performance Affected by Commuting Stress? (H. Gstalter, W. Fastenmeier). Who Will Reduce Their Car Use - and Who Will Not? (S. Stradling et al.). Perceptions of Car Users and Policy Makers on the Effectiveness and Acceptability of Car Travel Reduction Measures: An Attribution Theory Approach. (B. Gatersleben, D. Uzzell). The Prediction of Travel Behaviour Using the Theory of Planned Behaviour. (S. Forward). Public Acceptability of Travel Demand Management. (B. Schlag, J. Schade). Evaluations of Bike and Walk Systems. (A. Gärling, B. Berle).